Extractions & Wisdom TeethExtractions Occasionally a tooth may be so broken down by dental decay or have so little bone around it due to gum disease that it must be extracted. Extraction need not be so bad if it is done painlessly and quickly. The vital thing is to look to the future and prevent other teeth meeting the same fate. Wisdom TeethOften the wisdom teeth or third molars may cause serious problems as they try to erupt into the mouth. They may also impact upon bone, second molar teeth, or soft tissue and cause pain and discomfort. At Takapuna Dentists we will be able to diagnose these problems and help you to deal with them accordingly. Wisdom teeth that are healthy and properly positioned can be a valuable asset to the mouth. Unfortunately, this is often not the case, and problems develop that require their removal. For example, when the jaw is not large enough to accommodate these teeth, they can become impacted, that is, unable to come in, or move into their proper place. They may grow sideways, emerge only partway through the gum, or remain trapped beneath the gum and bone. 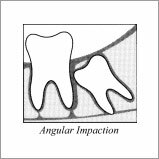 Impaction occurs most often in the third molars of the lower jaw. After examining your mouth and taking X-Rays, your dentist will discuss whether your wisdom teeth should be removed and advise you accordingly.